Numerology is the study of numbers and their influences on us. Determine your Life Path Number and Destiny Number, your Lucky Number, and other crucial numbers in your life. Learn what challenges you may have to overcome. Identify peak moments in your life. Explore your special talents and skills and how to use them wisely. Discover your hidden innate abilities. Numerology can be used in our daily lives for various purposes. Prosperity can be enhanced, stress can be relieved. Know what lies ahead of us. It is a guide like a weather forecast. Lucky dates can be used to start a business, house warming or even a career. It can be used to find lost objects and to give answers to questions. If the name or signature is not giving proper vibration, numerology can be used to correct the defects. These vibrations are subtle and over a time, they become very powerful. Numbers act as absorbers of cosmic energy and retransmit these energies to the user. We can tap along with their natural universal energy or go against it. Against the natural flow we attract imbalance and working along with its energies we balance our lives with peace and prosperity. Animals follow the natural laws without opposing it. They act upon their instinct they follow the laws without any rebellion. Why does a bull get agitated when it sees colours red or black? Because red represents war and danger and black represents miseries and sorrow. Only we humans with the sixth sense, do not follow these laws and fall into the ocean of miseries. Even if you are an expert swimmer, struggling in the ocean will not help you much. You need someone with a boat to save you and bring you to the shores of peace. The science and secrets of Numerology are very sacred and is given to us by God so that the struggling human race can use this knowledge to save himself. Do you know King Napoleon Buonaparte lost the war in Waterloo after dropping his ‘u’ in his name? Name before change 82, after the change 76! Sara was changed to Sarah by Jesus so that she can bear children? Sara is 7 and Sarah is 12 – a planet Jupiter, bestower of children. Numerology throws light into the compatibility between the business or personal partners. Oracles are constructed on the principles of numerology. Our ancestors assigned numbers for every ruling planet. 1 is for the Sun, 2 for the moon, 3 is Jupiter, 4 is Uranus, 5 is Mercury, 6 is Venus, 7 is Neptune, 8 is Saturn and 9 is Mars. Astrology calculations are based very much on the planets. Even countries are greatly affected by their vibrations. When Sri Lanka was known as Ceylon it was a country of peace and prosperity. Now it is a war-torn country. Ceylon in numerology adds up to 24, a number for prosperity. Sri Lanka adds up to 18 a number for quarrels, wars and hypocrisy. From Burma to Myanmar the number was changed from 15 to 18. Japan adds to 16 a number for rising to the top and fall, and 16 represents natural calamities. Second world war was an example of the rise and fall of Japan in a very short period of time. India adds up to 12, a number of spiritualism and sacrifices. 12 is the planet of Jupiter, the bestower for children. No wonder India is heavily populated. From Siam to Thailand the number was changed from 9 to 24, a positive move. If such a fate can affect a country what about we ordinary humans? We bring you yet another unique and very effective product, which is a combination of Vedic Astrology and Numerology, known as Navratna Pendant. Each gemstone is associated with a specific planet for maximum benefits and effects. 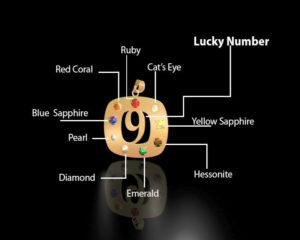 The Navratna pendant gives benefits of all the 9 planets to the user. Coupled with this customer gets a lucky number embedded in the pendant, which is unique to that person. The number is derived from the date of birth of the person or his/her birth name. Navratna is the exclusive arrangement of gems, which is featured in various astrological books. It is found to be very effective for everybody. The best part of Navratna is that it can be worn by anybody and any age group. Even if one has no horoscope. One can wear it without any horoscope consultation. It is found to be equally suitable for all, whether it’s a business person, executive, working ladies, house wives, school going children, retired person, old people. Gems are considered to be the best for strengthening the positive influences of planets. They intensify the rays of the planets they represent. Each gem stone is specific to ascertain planet and takes positive traits of that planet. People since ancient times have sensed powerful energies emanating from gemstone crystals and their ability to bring good fortune and ward off evil. These mysterious and coloured gems have great influencing and charming effect on human life. Based on purity and hardness, they have been performing great deeds by lessening the malefic effects of planets over the human life and they bring harmony in the good and adverse effects of planets. Sometimes the weak influence of planets and stars create an imbalance in life. The wearing of gems after proper astrological consideration of one’s horoscope can save mental imbalance, physical suffering and financial obstacles. In this way, gems serve as our armour and body guard. In the human body, the Sun represents the soul, the moon mind, the Mars perseverance, the Mercury voice, the Jupiter Wisdom (learning), the Venus Love, the Saturn sobriety, thoughtfulness. These planets influence human life and body continuously. In addition to these planets, there are two shadow planets (Rahu and Ketu) whose effect is also seen in life. The chemical nature of gems brings them in close contact with the man. They are crystals of clear and purified chemicals that are also found in the human body. Their contact with the electromagnetic field of the body becomes easy when they are embedded in pure electrolytes like copper, silver, and gold. With their slight and constant contact with the skin, they bring changes in the body chemistry by their interaction with the body’s energy field, which is permeated by a complex electromagnetic field. Ancient scriptures from across the world have appraised gems as powerful agents of energy that influence human fate and destiny, induce good energy, and expel the negative energy that causes sickness, suffering and psychosis. Gems bring peace, prosperity and happiness. In Indian tradition, the sacred gems relating to the nine planets are called The Nine Gems, or “Navratna”. Each of these gems has a traditional role to play in either strengthening or counteracting the power of its ruling planet. This is one of the most widely used gems to help achieve better financial status. The wearer may expect wealth, good health, name, honour and fame if the Gem suits him or her. It is also believed that if there are obstructions in finding a suitable match for a girl, she gets married early by wearing a Yellow Sapphire. This is normally light yellow in colour. Blue Sapphire removes evil effects of Saturn. It is said that this stone has the magical power to elevate its user to a higher status from all sides. Some astrologers believe that Blue Sapphire or Neelam is so powerful if used properly that it can alleviate even long-term misfortune. It could give you everything you could desire – health, wealth, longevity, happiness. It also restores lost wealth and property. Sapphire or Neelam is normally faint or dark blue in colour and is a very cold gem. It brings wealth, name and fame. Also gives good stamina, longevity and security in life. Can improve fertility in a barren woman. Best suited for joy, love and happiness. It cures fainting, fits, virility, mental disorder, deafness and baldness. Ruby is said to give name, fame, vigour, virtue, warmth and the capacity to command to its user. It can also raise the individual far above the status in which he was born. Historically, it has been symbolic of love and passion. Ruby helps to cure peptic ulcer, fever, rheumatism, gout etc. Ruby is normally red in colour and is a hot stone. Emerald improves faculties related to the brain such as memory, communication, intuition, the intellect, and the ability to learn. It is normally petal green or dark green in colour. Emerald is a hot gem. It increases intelligence and brainpower, removes and cures fickle-mindedness, loss of memory, stammering, fear from souls and spirits, cools the harsh speech. It is also useful for curing diarrhoea, dysentery, gastritis, peptic ulcer, asthma, insomnia, heart troubles, etc. It is said that Red Coral instils courage in its wearer. It also helps in curing blood -related diseases. It is normally red in colour. Coral ensures material happiness, recovery from diseases indicated by Mars such as fever, cough, bilious complaints, smallpox, chickenpox, headache, loss of vitality, piles, boils, measles etc. It is said that the one who wears a Diamond has a luxurious life. Diamond is also supposed to enhance the name, fame and artistic quality of the person. Diamond is a hot gem. It creates goodness and removes evil and fearful thoughts in the native. It improves financial conditions and blesses the native with comforts and peace of mind. It also enhances sexual power. It is also helpful in diabetes, diseases of urine, of private parts, syphilis, skin and uterine diseases. The shadow planet Rahu is supposed to be responsible for all sorts of delays or very late fulfilment of ambitions. Gomedh can help in achieving speedy success in less time than expected. Gomedh also improves dealing with people and protects its wearer from sudden misfortunes. This is normally reddish-chocolate in colour. Gomedh is cold in nature. It cures diseases caused by the affliction of Rahu and Saturn. It also increases appetite, vitality, confers good health, wealth and happiness and all-round prosperity. It is said to be the best gem to avert stomach ailments, disaster, insanity, and evil spirits. Cat’s Eye protects its wearer from hidden enemies, mysterious dangers and diseases. It is normally milky in colour. The gem is very hot in nature. Cat’s Eye is supposed to counter the evil effects of Ketu and diseases caused by Mars. It may prevent unexpected mishaps of life, paralysis etc. It protects the wearer from accidents and secret enemies. For businessmen, it is a miraculous result-giving stone, bestowing wealth by secret means like horse racing, gambling, stock exchange market and speculations. It also protects from drowning, intoxication, and Government punishment. It is said to bring fortunes to those who gamble (horse racing, casinos). One who possesses or wears a good pearl enjoys the luxurious life style and prosperity. This blessed one will live long and become free of evil, developing vitality and intelligence. He or she will achieve much renown and come to a high position due to the wisdom endowed by the pearl.